Juju Duarte is an old Bahian statesman that’s spent most of his life singing samba professionally. Da Rua Dos Ossos (or “From the Street of Bones” – it’s the name of the street he lives on, just north of the Pelourinho in Salvador da Bahia), recorded partly in his house in Brazil and partly here in San Diego, covers many styles of Brazilian music – samba velho, bossa nova, samba de roda, pagode. To the extent that all North and South American popular music is a mix of African and European, this album leans towards the African with more percussion and melody, less harmony and less frills. There’s also a lot of sounds recorded from the marketplace, the street, and Juju’s bird-filled house mixed in between songs. Taken as a whole, it is a portrait of a master singer’s many-hued life and loves. Juju Duarte is an unsung treasure of backstreet Rio de Janeiro. He sang for 20 years in samba clubs in Rio, but also at religious gatherings and street parties. His producer and collaborator here, American musical adventurer Beston Barnett, describes him as “an encyclopedia of Brazilian music.” That may be, but what makes this record so enjoyable, is its folksy, straightforward presentation, as if we, like Barnett, were invited into Juju`s funky home for an intimate music party. Most of these 19 tracks are tuneful bossa novas and gently loping sambas, backed minimally by acoustic guitar, bass, and light percussion, and featuring Juju singing fantastically beautiful melodies with joyful, informal ease. Juju can croon like a bossa nova romantic (“Estrada Do Sol”) or make a samba funky with scratchy romanticism (“Deixa A Vida Me Levar”) or as moody and melodious as a Cape Verdean morna (“Trem Das Onze”). But there`s a street edge to Juju`s performance that separates these recordings from just about any acoustic-oriented Brazilian release you`ll find. The album works in a couple of a capella performances, short stretches of Juju reminiscing in Portuguese, and some great ambient sounds – lots of singing birds, bands marching by, street drums, partying voices. All this makes for a fast-moving, deeply satisfying flow. Barnett plays a variety of instruments here, and invites others to bring in a delightful array of acoustic sounds – cavaquinho, flute, berimbau, and on one track, what sounds like a bassoon. The accompaniment is tasty but never obtrusive letting this be truly Juju`s session. There are a few familiar tunes here, two Jobim bossas, and a samba party classic, “Maria Baiana Maria.” But all but the best educated listeners will make discoveries in Juju`s “street of bones.” Two numbers, “Madelena” and “Ignacio” tilt towards Afro Cuban music, the latter even incorporating a clave pattern played on an African bell. If you long for the unvarnished, folksy side of roots samba – that magic mix of urban and rural – without a trace of artificiality or packaging, this one is for you. From juju music to Juju Duarte is a jump in continents as well as music style, but the simple acoustic recording of this Brazilian senior has the same allure of authentic music played well and with heart. The songs captured on this session span the history of Brazilian popular music from bossa nova to samba. Duarte sings with an expressive, rich voice that seems comfortable with the various styles, and equally confident in the various recording venues that range from living room to studio. During some of the songs, one can hear birds singing along in the background, and the rich ambient sound fills in the space between a few songs. I am a slave to percussion and appreciate the multiple textures created by producer Beston Barnett to capture the spirit of Bahia. `Le Le Le Baiana` features the iconic berimbau, stringed percussion foundation for capoeira; very nice. Snippets of live street music and sounds, mixed in with and between songs, add to the spirit of this recording, which offers an aural visit to Salvador, capital of Bahian culture. The CD ends with an extended conversation with Juju in Brazilian Portuguese, a beautiful language to listen to, but it is a track I chose not to put on the iPod. The rest of the album is thoroughly enjoyable, full of generous singing by an unheralded master. 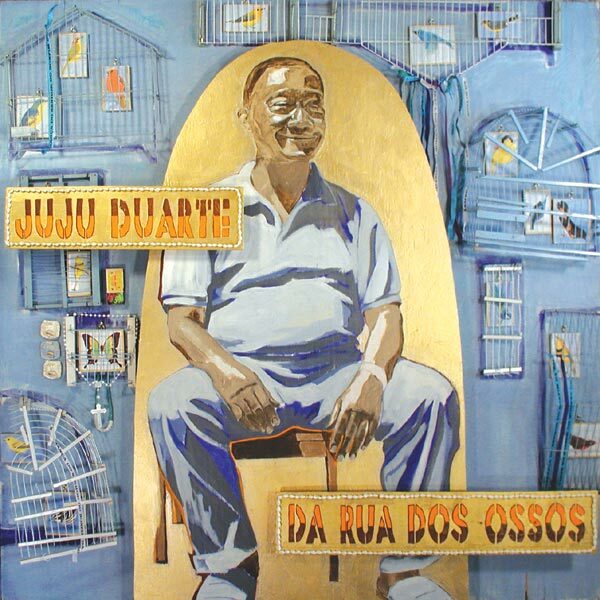 Da Rua Dos Ossos pays tribute to a legendary Brazilian singer, Juju Duarte. Producer Beston Barnett traveled to Salvador da Bahia in Brazil to record the vocals of the veteran singer. Additional music was recorded in San Diego (California). Duarte has dedicated most of his artistic life to singing samba. For Da Rua Dos Ossos, Duarte chose a collection of Afro-Brazilian songs which include several styles: samba velho, bossa nova, samba de roda, baiana, and pagode. The acoustic sound of the album has a charming unplugged flavor. Most of the musical accompaniment is composed of stringed instruments and a wide assortment of Brazilian and African percussion. Juju Duarte still lives on a Rua Dos Ossos (“The Street of Bones”), just north of the Pelourinho in Salvador da Bahia. The CD was partially recorded there and one can hear the sounds of songbirds in the backgrounds. A little bit for you. Precisa que haja vento sem parar. It must have unending wind. the grand illusion of carnaval. and it all ends on Tuesday(1). (1) These are Yoruba words or imitations of Yoruba words. There are traces of Yoruba religions scattered around the Americas; in some – like the santeria in Cuba – the original language or a fusion thereof is still spoken by the priesthood, in others – like the condomble of Brazil – the meaning has been forgotten, but the sounds are still repeated in songs and prayers. (2) The Filhos de Gandhi, or Sons of Gandhi, is the largest afro-bloco in Salvador da Bahia, about ten thousand strong. A bloco is like a team of revelers at Carnaval and other community events: the Filhos are all African-Brazilian men wearing all white, with white turbans and blue jewelry; their songs are older and use rhythms based in Afro-Brazilian religion. Quem do nosso amor duvide. Forte ou fraco, alegre ou triste. And hides there in the hills. Not even a little is allowed. Strong or weak, happy or sad. aí, entao, não vou pra casa não, senhor, nao vou, nao vou. When he hears a beautiful samba, doesn’t know if it’s beautiful or not. You don’t need harmony, to samba and to sing. What is it, my balangandã(2)? (1) Joujoux is a play name, but because it sounds like his name, Juju loved to sing this old song. (2) A large clasp worn by Bahian women with silver or gold amulets attached. Is a Bahian woman adorned with flowers. (1) “Saudade” is a famously difficult word to translate which means something like “longing” or “nostalgia”. In this amazing monologue, Juju talks about his time singing professionally in Rio de Janeiro, naming many famous musicians (listen for Ella Fitgerald and Gene Krupa) and reeling off five or six great songs he used to perform. Categories: album, Da Rua Dos Ossos (2006) | Permalink.